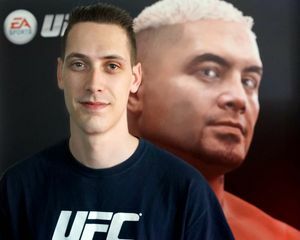 With EA Sports’ first UFC title just under a month away, Matt sits down with assistant producer Jazz Brousseau to talk old beefs, bodyshots, homophobia, and more. Q: Mixed martial arts is an extremely complicated sport with so many potential moves at any given moment. How do you distil something like that down into a game when boxing alone could use all the buttons on a controller? 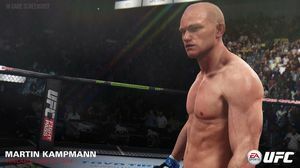 Brousseau: One of the things we really wanted to focus on was making the gameplay accessible, so we moved away from the Total Punch Control system of Fight Night. Throwing a strike is more of a quick-action move so we put that on the face buttons, whereas clinching and transitioning from different positions on the ground felt more natural to put on the sticks. The controls themselves individually are pretty simple – to throw a strike or initiate a takedown is pretty easy – but throwing that all together with some semblance of strategy is where the complexity comes from. So one of the things we’ve done with the game is we’ve added a Challenges mode, which allows players to practice very specific aspects of the fight game away from AI or the online community. For example, if I really struggle with takedowns I can train just takedowns. If I struggle with submissions I can train just submissions. Q: What was behind the decision to go new-gen console only, and to ignore PC? Was it hard to abandon the last-gen install base? Brousseau: At the time felt like maybe we were taking a risk, but looking back we’re really glad that we did it. The decision stemmed from building this game from the ground up. Having to support both gen seven and gen eight would have been a huge distraction from the goals we wanted to accomplish, namely; really selling the authenticity in gameplay and presentation. So it really came down to having to build the game in under two years – we built it in around 23 months. We just wanted to be really focussed on where our attentions were. Just transitioning to new-gen is a learning curve in terms of technical aspects. In terms of PC, that’s not really a decision for the production or design team, it’s a business decision. I’m sure that there is a team that makes a call on it and figures out if there is a large enough market for it. That said, never say never. It’s possible there will be a PC game in the future as we want to get the game in front of as many people as possible. If there is a market on PC, that’s something we will look at. Q: At one point in time, UFC president Dana White declared himself to be “at war” with EA. He claimed EA was “disgusted” by mixed martial arts, and that it didn’t consider even consider it to be a real sport. What changed? Brousseau: First I’ll say that [UFC co-owner] Lorenzo Fertitta and [UFC president] Dana White ended up coming down to our studio. They gave a big presentation, and they were down there for the entire day. Awesome dudes. There was no sense that there’s bad blood between the UFC and EA. They’ve been a great partner to work with, and they’re very involved. In terms of the decision to do a 180, you’d have to ask him! Q: Can you tell us a little about how the game’s career mode works? 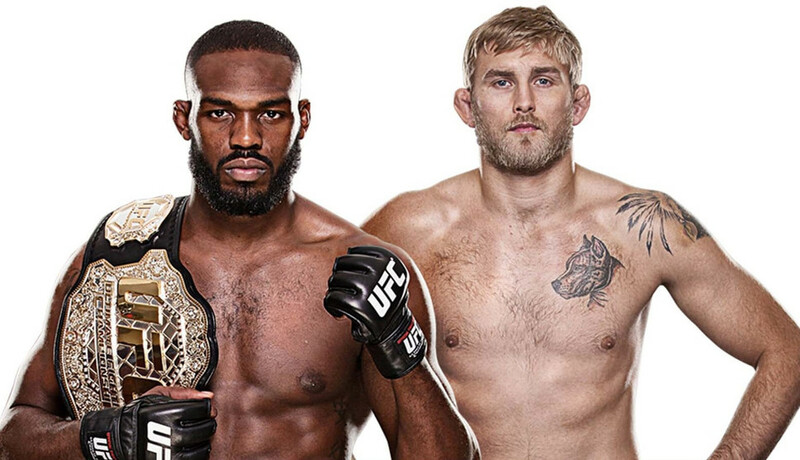 How does The Ultimate Fighter factor in? Brousseau: For the first time in any UFC game, players will start in The Ultimate Fighter reality TV show and fight other contestants for a spot in the UFC, and we’ve supplemented that with a lot of assets from the show. So you’ll train in the TUF gym, you’ll have a coach. You’ll have to do training and little minigames, and eventually you’ll make your way to the UFC with the goal of becoming a champion and being inducted into the Hall of Fame. Two really important aspects of career mode are longevity and popularity. It’s sort of a tug of war battle between “How exciting am I as a fighter?” and “How much damage do I take?” So one of the examples we point to a lot is: if I like to go into the octagon and just stand and brawl, I’m going to be exciting to watch and my popularity is going to be very high, but I’m taking a lot of damage, which is gonna make it very difficult for me to extend my career long enough to become a champ. Q: Are there body shot knockouts in the game? Brousseau: We do have a liver shot mechanic, and there is definitely the concept of, if I hit you with a really brutal body shot you were be very hurt and I can follow that up very quickly. [However] I play the game a lot, and I haven’t seen any body shot knockouts. Q: Can you pit a female fighter against a male one or vice versa? Brousseau: No. The tagline is “As real as it gets”, and in the UFC you can’t do that so we’re not going to allow that in the game. Q: Speaking of “as real as it gets”, how do you balance someone like Bruce Lee against the rest of the fighters? Brousseau: So first of all I’ll talk about ratings for the licensed roster. We worked very closely with the UFC to determine ratings for all of the guys. They are very brand conscious and very involved, which is good for us. We didn’t want them to be hands-off, particularly for this first kick at the can. So they had a say in the ratings for the fighters featured in the game. As for Bruce Lee, I wasn’t part of the decision-making process to add him to the roster. I do know that once the decision was made and the UFC got on board, together we approached Shannon Lee and Bruce Lee enterprises. Obviously she’s very interested in preserving his legacy. They ended up sending us a cast of his head, we did a 3D head scan, and that’s how he ended up being in the game. In terms of his game ratings, we worked very closely with the UFC to determine those. Q: What about retired fighters like Chuck Liddell? I guess you have to represent them at the peak of their powers. Brousseau: You have to. Absolutely. All of the legends, any retired UFC fighters –Royce Gracie’s in the game as well – they are judged at the peak of their careers. Brousseau: Right now, no. It’s absolutely something we talked about in pre-production and something we wanna get to. Simply because of resources and time it’s not something we were able to accomplish. In the future, I think you’ll see a lot more of that. It’s not just FIFA, NHL does it too. You’ll start to see a lot more of that real-world impact and what’s happening day-to-day in the sport in the videogame. Q: EA has always been very public about its pro-LGBT stance. Given that Jon Jones is one of two athletes on the cover of the game, has there been any discussion around his recent homophobic comments? 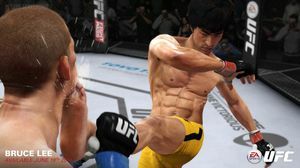 EA Sports UFC is out on PlayStation 4 and Xbox One on June 19.